Group Lockout Boxes will help you to consolidate your lockout tagout activities all in one place. They are a convenient central venue which makes it easy to manage highly energetic hazardous equipment. When a large team is working, isolate energy points with Group Lockout Boxes. 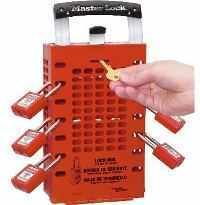 This solution will allow you to reduce the amount of locks required on a job dramatically. Quickly view who is still working without the need to go to each energy point individually. This is accomplished by having each worker place their own lock on the box and removing it once their task is completed. Power supplies or equipment will not be reactivated until it is verified that all workers are safe and out of danger. Lockout boxes should be made from durable material such as polycarbonate, steel or acrylic. Portable boxes are convenient and can make it very easy to follow mobile equipment from site to site.